Tsiigehtchic (/ˈtsiːɡɛtʃɪk/ TSEE-getch-ik; "mouth of the iron river"), officially the Charter Community of Tsiigehtchic, is a Gwich'in community located at the confluence of the Mackenzie and the Arctic Red Rivers, in the Inuvik Region of the Northwest Territories, Canada. The community was formerly known as Arctic Red River, until 1 April 1994. Population is 172 according to the 2016 Census, a decrease of 20.3% over the 2011 Census with 130 people identified as First Nations and 10 as Inuit. However, only 5 people said that an Indigenous language (Gwich’in) was their mother tongue. In 2017 the Government of the Northwest Territories reported that the population was 179 with an average yearly growth rate of 0.1% from 2007. The Dempster Highway, NWT Highway 8, crosses the Mackenzie River at Tsiigehtchic. During winter, vehicle traffic is over the ice, during the rest of the year, traffic is carried by the ferry MV Louis Cardinal. The ferry stops at Tsiigehtchic, on the eastern bank of the Arctic Red River, and on the southwestern and northeastern banks of the Mackenzie River, connecting the two legs of the Dempster Highway. The community is one of the few in the NWT not to be served by a permanent airport. In early September 2007, near Tsiigehtchic, local resident Shane Van Loon discovered a carcass of a steppe bison, which was radiocarbon dated to c. 13,650 cal BP. This carcass appears to represent the first Pleistocene mummified soft tissue remains from the glaciated regions of northern Canada (Zazula et al. 2009). ^ a b "NWT Communities - Tsiigehtchic". 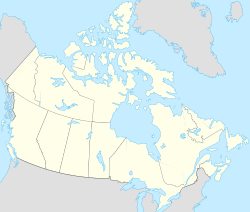 Government of the Northwest Territories: Department of Municipal and Community Affairs. Retrieved 2014-01-29. ^ "Canadian Ferry Operators Association 2006 Annual Report". Canadian Ferry Operators Association. 2006. Archived from the original (PDF) on 2009-11-22. ^ a b G.D. Zazula; G. MacKay; T.D. Andrews; B. Shapiro; B. Letts; F. Brock (2009). "A late Pleistocene steppe bison (Bison priscus) partial carcass from Tsiigehtchic, Northwest Territories, Canada". Quaternary Science Reviews. 28. pp. 2734–2742. This page was last edited on 12 March 2019, at 07:53 (UTC).